Fury is a new lightweight precision guided glide weapon designed for use by small UAVs, Class IV unmanned aircraft systems, and light attack aircraft. Image: courtesy of Textron Inc.
Fury was on display at International Defence Exhibition and Conference 2017 (IDEX) Image: courtesy of Mztourist. Fury was successfully launched from the Shadow tactical UAS in May. Image: courtesy of Textron Inc. The Fury is a lightweight, precision-guided glide weapon developed by Thales in association with Textron Systems Weapon and Sensor Systems. The weapon is intended for use by small unmanned aerial vehicles, Class IV unmanned aircraft systems, light attack, and intelligence, surveillance and reconnaissance (ISR) aircraft. The Fury was unveiled for the first time aboard a Beechcraft AT-6 during the 2014 Farnborough International Air Show, UK, held in July 2014. The development of the weapon was concluded in May this year. The first live drop of the Fury from the Shadow 200 UAS was conducted in August 2014. The lightweight weapon successfully engaged and detonated on the target. Live fire demonstrations of the Fury were also conducted using a Shadow tactical unmanned aircraft system (TUAS) at the Yuma Proving Ground, Yuma, Arizona, US, in September 2014. The Fury munition was fired successfully from the Shadow TUAS against static vehicle targets in April 2016. The weapon, which was released from an 8,000ft altitude, successfully engaged the target during the test. The precision-guided glide munition was successfully launched from Shadow TUAS against moving targets at Yuma Proving Grounds, which concluded the end-to-end testing of the Fury weapon in May this year. The testing phase involved a total of 13 flights conducted from multiple unmanned aircraft platforms. The Fury weapon is based on the lightweight multirole missile (LMM) range of precision weapons developed by Thales. It lacks arocket motor and offers a lower footprint than LMM. The common interface of the munition allows for rapid integration onto a range of manned and unmanned aircraft systems. The platform-agnostic weapon can be fitted to the aircraft through a single pylon mount or a multi-carriage launcher. The lightweight platform also enables the aircraft to carry multiple weapons in place of a larger weapon, increasing the capability to strike several targets. It creates lower drag, which causes nominal operational impact to the performance characteristics of the aircraft, including speed, endurance and range. "The precision-guided glide munition was successfully launched from Shadow TUAS against moving targets at Yuma Proving Grounds, which concluded the end-to-end testing of the Fury weapon in May this year." The high accuracy and simple-to-use characteristics of the munition also make it ideal for unmanned aerial vehicles(UAVs) and light attack aircraft. 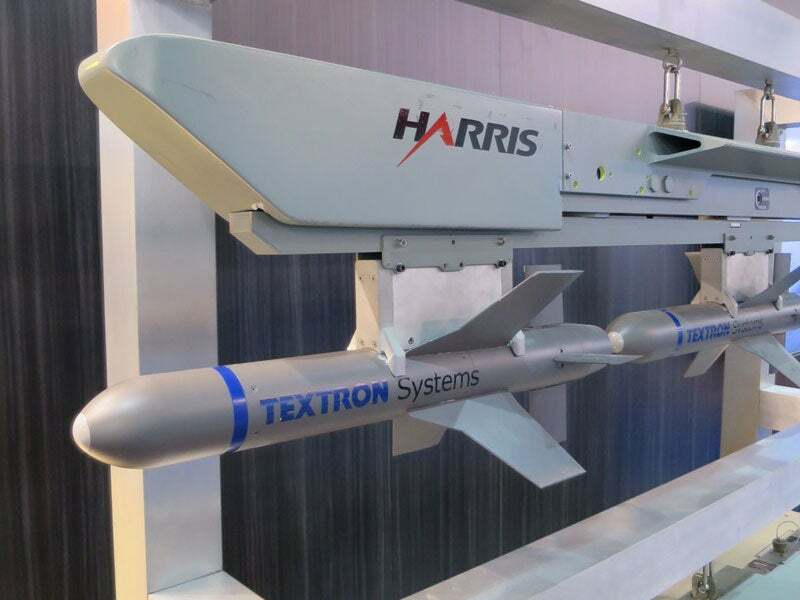 It also provides off-axis strike capability to manned and unmanned aircraft, while it serves as a low-cost alternative to self-propelled missiles. The compact weapon has a length of 68cm (26in), diameter of 7.5cm (3in), and gross weight of approximately 6kg. The weapon carries a dual-effect-shaped charge and pre-fragmented blast warhead, which has a tri-mode fuse with impact, height of burst, and delay modes. The warhead enables the engagement of static and moving targets, including light armoured vehicles, small boats, and personnel at a maximum range of 4,000m, when launched from an altitude of 3,000m. The Fury munition integrates a selective availability anti-spoofing module (SAASM) GPS-aided inertial navigation system, and a semi-active laser (SAL) seeker that provides mid-course and terminal guidance capabilities. These systems enable 360° engagement of targets. The weapon can strike both fixed and moving targets with 1m accuracy, and can be guided to particular target coordinates. The control actuators and enlarged fins on the munition offer superior flight control and increase the lift, respectively.